I’m sitting in the living room of Alfredo Rolando Ortiz, interviewing him about his upcoming concert with the Corona Symphony Orchestra. He must have noticed the quizzical look on my face as he filed his nails. 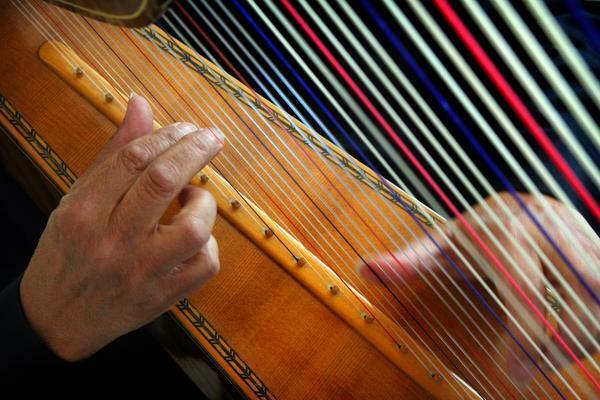 Ortiz, 67, plays the harp, which is something like saying that Van Cliburn played the piano or Pavarotti was a singer. The harp is an extension of the Corona musician, an instrument he chose over a stethoscope after he earned a medical degree and practiced for eight years. After our interview, we retired to his studio where a large harp filled one corner. It’s the harp he uses to teach students who come from all over hoping to learn how to one day maybe approach the skill of the master. Ortiz unzipped the case of a second harp, the one that travels with him around the world on tours. As I listened, it dawned on me why artists often depict angels holding a harp. My eyes had closed on their own, without my permission, and I heard what heaven must sound like. It was the sound of several harps, not just one, and I had to open my eyes to assure myself that only Ortiz was playing. During our earlier interview, Ortiz explained that while Americans think of the harp in terms of classical music only, compositions worldwide cover the spectrum of music, including folk, rock ’n’ roll and even dance music. Ortiz was 11 in 1958, when his family moved from Cuba to Venezuela. Acclaimed harpist Alfredo Rolando Ortiz plays the harp together at his Corona home on Thursday, Sept. 18, 2014. 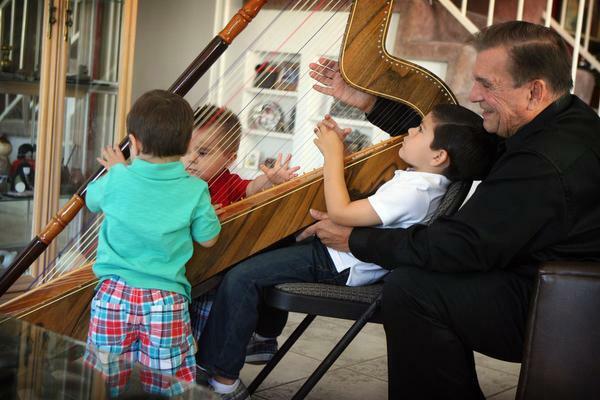 Acclaimed harpist Alfredo Rolando Ortiz and his grandkids, Tristan Emerson-Ortiz, 23 mos., James Kreder 21 mos., and Eric Emerson-Ortiz, 5, left to right, play the harp together at his Corona home on Thursday, Sept. 18, 2014. 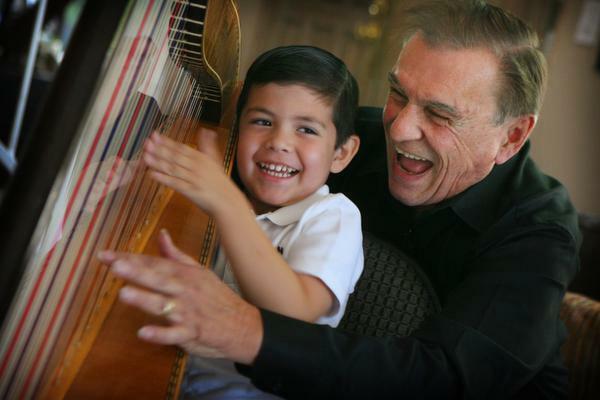 Acclaimed harpist Alfredo Rolando Ortiz and his grandson Eric Emerson-Ortiz, 5, play the harp together at his Corona home on Thursday, Sept. 18, 2014. Four years later, he learned to play the Venezuelan folk harp from a school friend. He took lessons, and in two years he was performing professionally and recording an album while studying medicine. Composing, recording and playing the harp paid for his medical education. In medical school, Ortiz met Luz Marina Otero. They have been married for 37 years and have two daughters. He practiced medicine in Colombia for five years, then moved to California to continue his education in music therapy. When Marina became pregnant, Ortiz was faced with a tough choice. He was practicing medicine during the day and performing on the harp seven nights a week. “Life became complicated with the baby coming,” he said. So he gave up his medical practice to devote his life to his family and the harp. Ortiz is known for his compositions as much as for his playing. In 1996, he composed the South American Suite for Harp and Orchestra, and three years later performed it at the World Harp Congress in Prague with the Prague Radio Symphony Orchestra, as more than a thousand classical harpists from around the world sat in the audience. At the World Harp Congress in Amsterdam in 2007, he composed a piece written for four harps. Instead, it was performed by 232 harpists, setting a Guinness world record. But no performance comes close to the one Ortiz gave before a much smaller crowd on New Year’s Eve 1980 in the delivery room of Circle City Hospital. There, Marina gave birth to their second daughter, Michelle. Ortiz used his medical skills to coach Marina during labor. As delivery neared, he began to play. “I improvised with the harp, and I heard the first cry of my daughter. It was the most important concert of my life,” he said. Years later, he would repeat that performance for the births of two of his grandsons. Ortiz and his wife were living in Long Beach in 1978 when his uncle, Dr. Edmundo Yrigoyen, who had a practice in Corona, suggested they move to the Circle City. They have lived there since. When I asked him about playing his South American Suite with the Corona Symphony, he smiled. “This is my home. I’m a little nervous, but I’m so excited to perform here,” he said. And so is Don Kindred, executive director of the orchestra. “Alfredo and I have been trying to coordinate a date to perform together for many years now and I am truly honored and excited to have the opportunity to collaborate,” he said. The concert will be at 7 p.m. Oct. 18 at Northpoint Church, 988 W. Ontario Ave., Corona. The church hall seats 900 and has excellent acoustics. Tickets purchased online are $14 for adults and $12 for students and seniors. At the door they’re $2 more. Ortiz will perform for about 35 minutes with some superb musicians. Close your eyes and you just may think you’re in heaven.